Do you notice something wrong here??? That is so wrong!! Somebody is not doing their job!!! Where's the food? This is what our bowls look like right now too! That's how our bowls look too. However as soon as they out down the stinky goodness Fiona eats it all. I can't win! Who do we complain too? I could just keel over in a faint seeing photos like that. I hope you got fed SOON. I notice you have really cute placemats, and a HUGE foodbowl! 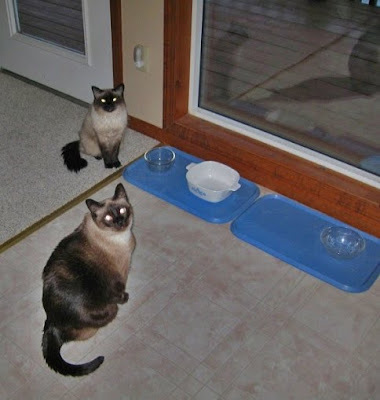 The white bowl is actually our water bowl Daisy, we needed water too, there was just a few sips left ... hee hee! Oh, and Simon's food dish is on our computer table, for some reason he will usually only eat there now. Poor Sabrina, Sam, and Simon. We can see your bones from here. Has Simon eaten enough for three? Hee Hee! Oh no! You poor starving kitties. We hope you didn't have to wait much longer for your food. Empty bowls? That's unforgivable! We think a barf or two in an interesting spot (pillow or shoe?) would be purrfect. First of all, Happy late Gotcha Day! Second, you two are not doing your job! How on earth did you ever let your food bowl get EMPTY!!!!!????? Third, even though I am late, and you can thank my mom for that, I wanted to say how happy I was that you came over and helped me celebrate my first birthday last Friday. I hope you had a good time. Disco is on a diet, so we all have to suffer (except Coco who is expecting, so she gets to eat whenever she asks) so our bowls look like yours all day long and we only get crunchies once at night! We feel your pain! Thank you so much for all the purrs and prayers for our little hansel. It means the world to us- and we truly believe that with everyone in the cb - it's how we got through all of this. We don't know what we'd do without everyone! Hansel is doing very well - walking around, but we did have to put his cone on- as he thinks he should eat his sutures. He is eating, taking meds, drinking, using the litter box, everything is fantastic!